The Community Food Pantry provides food to local families on Wednesdays and Thursdays each week. Hours are listed below. The Pantry is located in Barrett Hall (rear entrance of the church). We welcome everyone. Each week, we provide bags of food for about 500 families in need. People may visit the Food Pantry once per week. Food is allocated based on the number of people in the family. Also included in the church’s food ministry is our weekly Wednesday St. Joe’s Kitchen, supported by several local churches, at which a free hot meal is served. Donations are always welcome. The Pantry often requests specific items for a given month — typically toilet paper or peanut butter. Diapers are always needed. Thank you! We have almost 150 people who have give time to help with the Pantry and meal. Volunteer hours through the Retired Senior Volunteer Program (RSVP) total about 1000 hours per month! Volunteers from other churches and from the community assist us. Many of the people who receive food weekly also help with the Pantry. We can always use more help in accepting deliveries from the Western Massachusetts Food Bank, setting up the tables, and greeting our constituents. The Community Food Pantry began as an outgrowth of St. Joe’s Kitchen in the 1990s — 12 emergency bags of groceries available after the meal. It grew from there to bags given out in the office, and then in the Red Carpet area through the first decade of the 2000s. Around 2010 it moved downstairs and we joined the Western MA Food Bank shortly thereafter. It has grown from a few families per week to over 500 families per week, thanks to Mary Wheat and her volunteers. South church served 5,724 local people in 2016. 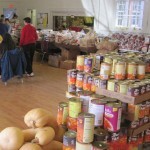 It is the largest pantry program in the Berkshires. Our Food Pantry and the food insecurity issue in Pittsfield, MA was captured in a 2015 photo exhibit by Nick DeCandia and video by Michael Sinopoli that traveled from Pittsfield to the State House in Boston. Learn more about the Take Another Look exhibit. We purchase large quantities of food at a significant discount through the Western MA Food Bank, which works with local farmers. The Western Mass Food Bank depends upon the Massachusetts Emergency Food Assistance Program (MEFAP) for 25% of its funding. It is estimated that the 1st District’s Food Insecurity rate is 12% overall, and probably much higher in Pittsfield and some of the hill towns. Local farmers, grocers, and other churches also supply the South Church pantry with additional produce and bread. Volunteers pick up food donations from grocery stores daily. The Food Pantry needs more money to purchase meat, dairy and eggs on a regular basis. 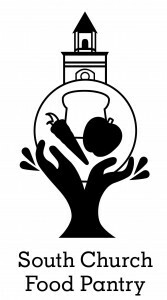 We are currently encouraging people to let their representative and the Governor know that an increase in MEFAP’s funding is desperately needed to feed the hungry here in the Berkshires and throughout the Commonwealth. Additional dry storage is needed. In the summer of 2017, we will need to refinish the Pantry space floor ($2,000). 2016 expenses from the Food Ministry Report totaled $21,000, which includes food, supplies, and some church expenses. In 2015, we updated our 1932-era kitchen where our Wednesday meal, St. Joseph’s Kitchen at South Church, is prepared. The elevator was installed in the early 90s during a capital campaign. New walk-in coolers and freezers cost about $25,000 (paid for via South Church’s Capital Fund Campaign and a $5,000 grant from the Western MA Food Bank). Other costs, such as the elevator, are absorbed in the church budget. The Church Street entry, used for food delivery, was renewed last year (a $6,000 cost) with a combination of grants from the Pittsfield Rotary, First Church of Christ—Pittsfield, and private gifts through a Go Fund Me campaign. Bread & Roses Coffee House, the Community Food Pantry, and St. Joe’s Kitchen all came about from individuals having a dream that became an intention, which was brought to life by others who shared the vision, and a church willing to put itself on the line for projects that stretch us all. This is what we’re about, and if others wish to donate, volunteer, or learn more they are all welcome!